Supreme Court Hobby Lobby decision: Where was Antonin Scalia? For a hands-off court, this one sure is hands-on. 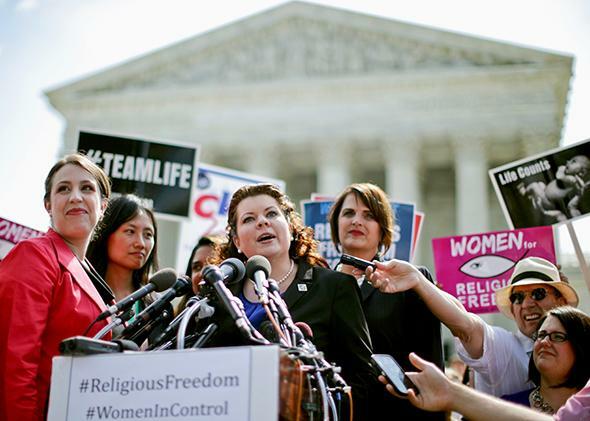 Lori Windham, senior counsel for the Becket Fund for Religious Liberty, speaks in front of the Supreme Court after the decision in Burwell v. Hobby Lobby on June 30, 2014. One of the big mysteries of this morning’s announcement of decisions in Harris v. Quinn and the Hobby Lobby case is that Justice Antonin Scalia is not present. He’s here in spirit. After last week’s honeymoon phase of faux-nanimity, and Scalia’s varied and impassioned faux-currences, he is probably happy for the clarity: We are back to the era of 5–4. In other words, the term ends as it should: showing exactly how divided this court and this country really are on the most basic questions of equality, workers’ rights, women’s rights, and—perhaps above all—religious liberty, which is again a boom industry at the Supreme Court. Yes, corporations win big today. And women lose, huge, again. As the court extends the personal protections of the Religious Freedom Restoration Act to for-profit corporations, like the one belonging to Hobby Lobby’s Green family, with its more than 500 craft stores and more than 13,000 employees, it does so with the promise (pinky swear) that it will not ripple into a series of disastrous outcomes when employers decline to afford their workers vaccinations, or psychiatric care, or equal pay, based on similarly strongly held religious convictions. Nor will it implicate corporations that aren’t closely held, although—as Larry notes—Justice Alito seems unable to pinky swear to that either. Having read the opinion only briefly I am not at all clear on why Justice Samuel Alito, writing for the majority, is so certain that he can hold the line here to closely held corporations and that the parade of “me too” litigants promised by Justice Ruth Bader Ginsburg, writing in dissent, won’t show up on the court steps in the coming months and years. For one thing we are—going forward—no longer allowed to argue the science. “It is not for us to say that their religious beliefs are mistaken or insubstantial,” writes Alito. Also, going forward, we are not allowed to argue the depth of religious conviction. Once those are off the table in this case, they are either off the table forever, or the court will decide in the future what’s off and what’s on. So I’m not sure which it is: Is the court planning to protect us from the religious demands of employers who espouse religions it deems unserious, or only from government interests it deems unserious? (If we learned anything at all last week, it’s that women’s reproductive health is not deemed serious.) What worries me most of all about Alito’s gauzy recitation of the Green’s up-by-their-bootstraps family business tale is that it is, of course, the tale of the Waltons and the Kochs, too; some 90 percent of U.S. companies may qualify as “closely held.” And the fact that the Greens have, as Alito explains, a religious-based need to offer health care to their workers (thus they can’t pay the penalty). “The Hahns and the Greens and their companies have religious reasons for providing health-insurance coverage for their employees” which is, in turn, countered by a religious-based need to take some of it away. The paternalism here doesn’t really counter the other paternalism. It just renders it extra creepy. Some of you will say that all this uneasy balancing that happens between the solicitude for the employer’s religious rights and the strength of the government interest doesn’t matter anyhow, since the real issue seems to be that there is an easy accommodation, and that is why the government loses. Certainly it feels that this is an easy case for Justice Anthony Kennedy, writing in concurrence, because the Obama administration helpfully mapped out a less restrictive solution and offered it to the not-for-profits. Maybe this case only stands for the proposition that when it’s a wash—when religious rights are burdened and government interests are important(ish)—the government can always pay. I have to do some more thinking about what this accommodation means; at first blush, I think that shifting the burden from employers onto the taxpayer is problematic: as Justice Ginsburg points out in dissent, can religious employers who believe women should be paid less than men just make the rest of us subsidize that view? And more worrisome still, doesn’t this create huge incentives for every for-profit corporation to find religion, and fast? I recognize that in the true spirit of Hobby Lobby this first post from me is somewhere between a RFRA scrapbook and a quilt. I look forward to the views of the rest of you. For me, I put this case at the interstices of McCullen and Town of Greece: For a court that claims it has an abiding interest in staying “out of the business of [evaluating] the relative merits of differing religious claims or the sincerity with which an asserted religious belief is held,” the Roberts court must be the most hands-on hands-off court in America, at least when it comes to religion.